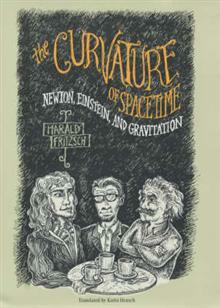 The internationally renowned physicist Harald Fritzsch deftly explains the meaning and far-flung implications of the general theory of relativity and other mysteries of modern physics by presenting an imaginary conversation among Newton, Einstein, and a fictitious contemporary particle physicist named Adrian Haller -- the same device Fritzsch employed to great acclaim in his earlier book An Equation That Changed the World, which focused on the special theory of relativity. Einstein's theory of gravitation, his general theory of relativity, touches on basic questions of our existence. Matter, according to Einstein, has no existence independent of space and time. It is even capable of bending the structure of space and changing the course of time -- it introduces a "curvature." Gravity emerges not as an actual physical force but as a consequence of space-time geometry. Even the apple that drops from the tree follows the curvature of time and space. In this entertaining and involving account of relativity, Newton serves as the skeptic and asks the questions a modern reader might ask.Einstein himself does the explaining, while Haller explains the new developments that have occurred since the general theory was proposed. The result is an intellectual roller-coaster ride in which concepts that have entered the vernacular become clear for the first time: the Big Bang, "black holes," elementary particles, and much more. Harald Fritzsch holds the chair in theoretical physics at the University of Munich and is also a visiting professor at the California Institute of Technology and at the European Center for Particle Physics (CERN) in Geneva. He is the author of many books that have been translated into English, including The Creation of Matter: The Universe from Beginning to End, Quarks: The Stuff of Matter, and An Equation That Changed the World: Newton, Einstein, and the Theory of Relativity.